The first Challenge was designed and patented in 1896. The design was recreated by skilled English craftsmen and was handmade using the original sewing techniques and the finest leather. This tool bag is for fitment to the rear of a saddle bearing bag loops. It features buckles that whilst fastening the bag to the saddle, are located within the hold itself, thus ensuring greater levels of security and the strap that secures the unit encircles the tools it carries, to prevent them from rattling during transit. HANDMADE IN ENGLAND- Manufactured using 100 year old traditional techniques and the highest quality materials. INTERIOR BUCKLES- The saddle buckles are within the bag to prevent annoying vibrating. 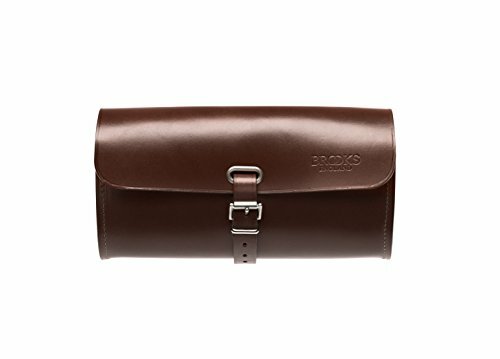 VEGETABLE TANNED LEATHER- Brooks only uses the finest European vegetable tanned leather for their bags, straps and accessories. SADDLE ATTACHMENT- The Challenge Tool Bag comes with two straps that easily attach to your saddle. If you have any questions about this product by Brooks England, contact us by completing and submitting the form below. If you are looking for a specif part number, please include it with your message.